This LIGHT-WEIGHT series is designed to provide maximum protection for most press brakes and smaller presses where working space is at a premium during set up and maintenance. These LIGHT-WEIGHT blocks provide convenient use and handling for your employees. The 6061-t651 high-strength aluminum body is machined to give you ultimate stiffness with maximum adjustability. These blocks are one-third (1/3) of the weight of standard safety blocks available from others. When you make it easy for your employees, they will use it! 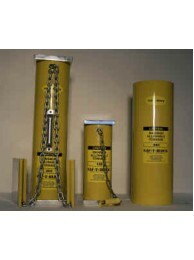 Safety practices quickly become a habit with the Saf-T-Block LIGHT-WEIGHT Press Blocks. The LIGHT-WEIGHT Saf-T-Blocks come standard with a 3.5" round base plate. Base plates allow for stability where room permits. Light-weight Fixed Length Saf-T-Blocks are available with steel holders and power cut-off systems. Choose between 7" - 7.75" Fixed Length Light-Weight Safety Block with End Caps. 35 Ton Maximum .. Choose between 8" - 8.75" Fixed Length Light-Weight Safety Block with End Caps. 35 Ton Maximum .. Choose between 9" - 9.75" Fixed Length Light-Weight Safety Block with End Caps. 35 Ton Maximum .. Choose between 10" - 10.75" Fixed Length Light-Weight Safety Block with End Caps. 35 Ton Maximu.. Choose between 11" - 11.75" Fixed Length Light-Weight Safety Block with End Caps. 35 Ton Maximu.. Choose between 12" - 12.75" Fixed Length Light-Weight Safety Block with End Caps. 35 Ton Maximu.. Choose between 13" - 13.75" Fixed Length Light-Weight Safety Block with End Caps. 35 Ton Maximu.. Choose between 14" - 14.75" Fixed Length Light-Weight Safety Block with End Caps. 35 Ton Maximu.. Choose between 15" - 15.75" Fixed Length Light-Weight Safety Block with End Caps. 35 Ton Maximu.. Choose between 16" - 16.75" Fixed Length Light-Weight Safety Block with End Caps. 35 Ton Maximu.. Choose between 17" - 17.75" Fixed Length Light-Weight Safety Block with End Caps. 35 Ton Maximu.. Choose between 18" - 18.75" Fixed Length Light-Weight Safety Block with End Caps. 35 Ton Maximu.. Choose between 19" - 19.75" Fixed Length Light-Weight Safety Block with End Caps. 35 Ton Maximu.. Choose between 20" - 20.75" Fixed Length Light-Weight Safety Block with End Caps. 35 Ton Maximu.. Choose between 21" - 21.75" Fixed Length Light-Weight Safety Block with End Caps. 35 Ton Maximu.. Choose between 22" - 22.75" Fixed Length Light-Weight Safety Block with End Caps. 35 Ton Maximu.. Choose between 23" - 23.75" Fixed Length Light-Weight Safety Block with End Caps. 35 Ton Maximu.. Choose between 24" - 24.75" Fixed Length Light-Weight Safety Block with End Caps. 35 Ton Maximu.. Choose between 25" - 25.75" Fixed Length Light-Weight Safety Block with End Caps. 35 Ton Maximu.. Choose between 26" - 26.75" Fixed Length Light-Weight Safety Block with End Caps. 35 Ton Maximu.. Choose between 27" - 27.75" Fixed Length Light-Weight Safety Block with End Caps. 35 Ton Maximu.. Choose between 28" - 28.75" Fixed Length Light-Weight Safety Block with End Caps. 35 Ton Maximu.. Choose between 29" - 29.75" Fixed Length Light-Weight Safety Block with End Caps. 35 Ton Maximu.. Choose between 30" - 30.75" Fixed Length Light-Weight Safety Block with End Caps. 35 Ton Maximu..